The red front looks ant-like and their rear looks beetle-like. 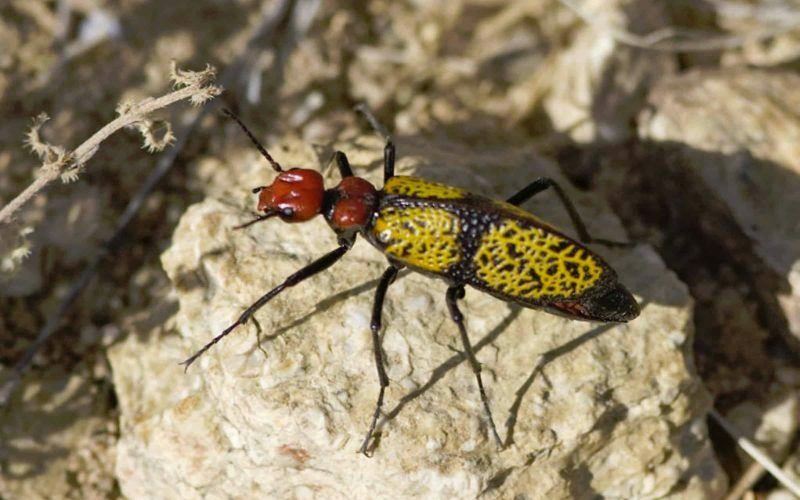 Each spring in April, brightly colored Iron-Cross Blister Beetles appear in the Sonoran Desert to feed and find proper hosts for their offspring. They are up to 1.5 inches long and easily identified by their brilliant red head, and bright yellow back marked with a strong black cross. The red front looks ant-like and their rear looks beetle-like. These beetles have a product called cantharidin in their blood which is a potential blistering agent. The chemical is produced by the male and transferred to the female during mating. When disturbed, their leg joints ooze blood that may taste bad or be painful to a predator. To a human, it may cause skin blistering or severe to lethal poisoning if ingested. Their bright colors advertise this defense. Iron-Cross Blister Beetles emerge in April from digger bee nests, usually in loose soils. They feed on spring annuals starting in the late morning and continuing until the late afternoon. After mating, females seek Palo Verde trees in bud stage, lay eggs at the base of the buds, and then die. The eggs and buds develop together, eggs hatching when the flower opens. Larvae wait in the flowers for native bees to arrive and then hitch a ride back to the nest. There the larvae change into short-legged grubs that consume the bee offspring as well as the pollen and nectar provisions. They pupate in the nest and wait for next spring to emerge as adults. This photograph was taken in May 2008 in lower Sabino along the Lake Trail.